I was always told there were two things certain in life—death and taxes. Well, as a home theater enthusiast, I think that list should have one more addition—that the HDMI (High Definition Multimedia Interface) spec will continue to change. It's hard to believe it's been 17 years since eight major consumer electronics manufacturers got together to create a new universal connector with a few goals in mind. First, it had to be backward compatible with the pre-exisiting video-only digital connector known as DVI. Second, the connector needed to be smaller than the bulky multi-pin DVI connector—remember those monstrosities? Third, it needed to allow enhanced Y'Cb'Cr signal capability and also communicate Consumer Electronics Control (CEC) functions that would allow some degree of optional control of source and display devices. Finally—and this was a big one— it had to provide High-bandwidth Digital Content Protection (HDCP), a sophisticated form of copyright management, in order to keep the movie studios happy. Anyone who has lived all these years with HDMI knows that, as consumers, what we got was a royal pain in our collective rear-ends. While the HDMI connector did end up being smaller than the DVI connector, it's still not an easy chore to route one through walls in custom install situations—the head end of the cable is still quite large, and traditional HDMI cables can't be terminated by installers after running the wire alone. Also, the HDMI spec has been a moving target since 2002 as features have been added such as ARC (Audio Return Channel) and 3D, which instantly made legacy cables unable to perform their required functions under the increased bandwidth requirements. This has made longer cable runs even more troublesome since, to accommodate the higher throughput, the cables require less copper resistance which leads to another problem—heavier cables. Fortunately, technology took over and "active" cables became all the rage as 4K made its debut a few years back, and they have continued to evolve and improve. These cables, whether fiber-optic or using other technology to boost signal strength or improve bandwidth, allow runs as long as 200 feet. That's just dandy, although it doesn't fix the problem of having to pull a new cable through your walls from your source components to your display every time the spec evolves and the HDMI bandwidth requirements expand again. Hence, the invention of wireless HDMI solutions, of which DVDO is one of the leading innovators. In fact, they've had various products in this area going back to 2012 including the DVDO Air, the Air3, Air3C and Air3C-Pro. Each subsequent product offered more for the end-user as the HDMI spec has evolved, but one thing they had in common is that they capped out at 1080p/60 resolution. That's become a serious limitation in our new 4K world. Enter the DVDO Air 4K, which like DVDO's past products is based on Silicon Image's 60 GHz WirelessHD technology. The company's marketing material claims that the Air 4K delivers cable-like reliability, leveraging advanced radar technology used in fighter aircraft. It sells for $399. 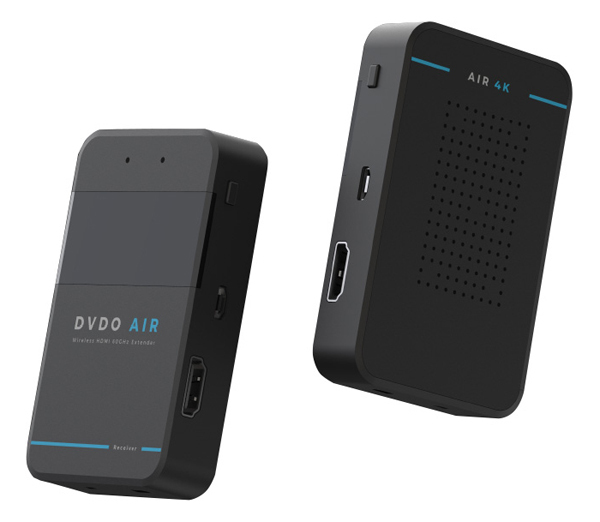 Along with the Air 4K, DVDO also currently offers the Air 2K ($229) using the same WirelessHD tech and offering similar performance in situations where a maximum resolution of 1080p/60 (4:4:4, 12-bit) is sufficient. While most people don't need to hunt down and kill enemy aircraft in their home theaters, it's nice to know that a 60 GHz phased-array beam-forming technology is scanning the room and looking for the best path from the transmitter to receiver for every frame of video...up to 60 times per second. Since it uses the 60 GHz spectrum, the system is essentially free from interference—unlike wireless systems that rely on 2.4 GHz and 5 GHz-based Wi-Fi networks that are subject to interference and must also compress the signal due to bandwidth restrictions. The Air 4K can transmit data at a blazing 3 gigabits per second up to 66 feet away, although closer is better for best results (DVDO actually advertises 10 meters, or 33 feet). And your chances of wire-like performance improve if you can provide a direct line of sight between the transmitter and the receiver. Wireless HDMI offers advantages well suited to certain types of installations, notably projector retrofits where there's no way to run signal cables while the walls and ceiling are still open during construction. But it comes at a cost. With the Air 4K, video signals are capped at 4K/30 Hz with 4:4:4 or 4:2:2 compression and 8-bit signal depth via the system's HDMI 1.4b/HDCP 2.2 ports. Audio tops out at 7.1 channels, including Dolby TrueHD and DTS-HD Master Audio. But this means there's no 4K/60Hz video content or Dolby Atmos transmissions. Many users will be routing their HDMI source components through an AVR, so not having Atmos compatibility should be a non-issue for most people since the audio will be stripped out by the AVR before sending the video signal to your display—as it is in my theater. The Air 4K couldn't be simpler to set up. The box comes with a transmitter and receiver which are each about the height and width of a credit card (3.5 x 2.5 inches) and an inch thick. This allows them to be easily hidden behind a display or atop a ceiling-mounted projector. A pair of 5-volt USB power supplies are provided, one for each unit, which also means you may be able to pick up power off a powered USB port on your display if one exists and skip the power-supply at that end. Along with a power connection, all one needs to do is plug a high-speed HDMI cable into the transmitter from your source component then do the same from the receiver to your display. Each of the units provide LED lights which will indicate when they've locked upon one another and, voilà, you have a wireless video signal. Both the transmitter and receiver have buttons that will wake the units up from a sleep, reset the unit to factor defaults, or allow for the transmitter to be paired with multiple receivers in a room to service different displays. (DVDO does not sell receiver units separately, however.) Both the Air 4K and Air 2K are also supported with a free Windows desktop utility that can be used to check the status of the connection and facilitate firmware updates. 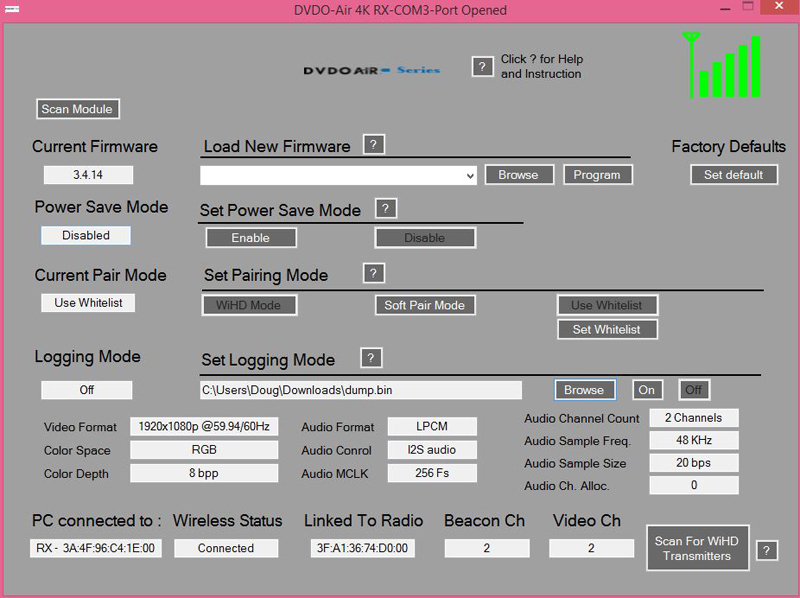 DVDO supports the Air 4K with a software utility that can be used to set some basic functions, check connection status, and update firmware. My system isn't overly complicated and consists of a TiVo Bolt DVR, Panasonic UB820 UHD Blu-ray player, Roku Ultra media streamer, Anthem AVM60 pre/pro, and a JVC DLA-X750R UHD-compatible projector. I lived with the DVDO Air 4K in my system for two weeks and for the most part, it worked as advertised. Each time my system powered on, the transmitter and receiver were able to negotiate an HDMI handshake and a picture appeared on my display. I ran some 4K test patterns over HDMI and noticed no loss of quality versus a wired connection. Still, the actual user experience wasn't entirely trouble free. On a couple of occasions I endured signal dropouts. The first instance was while watching the excellent Oscar-nominated film Hacksaw Ridge on UHD. When the destroyers unleashed their massive guns on the Japanese forces, for some reason my screen went blank. Since my JVC's HDMI handshake process is so slow, I was without a picture for nearly 30 seconds until it locked back onto the signal (no fault of the DVDO system there). I replayed the scene a second time and it played through as it should, however. A similar experience happened during the UHD of Aquaman—yet another scene which also has copious amounts of bass. Fortunately, these incidents were isolated and never repeated on the same scenes or any other, so I'll chalk it up to gremlins. Ultimately, this was a minor inconvenience and while not perfect, the Air 4K maintained a signal lock close to 100% of the time. A second and more significant issue was not with the system's operation, but with the aforementioned limitation with internet-streamed titles from my Roku Ultra streamer. The Air 4K worked perfectly with 4K/24 Hz HDR content from my UHD Blu-ray player. But UHD HDR content from different movie services received different treatments when the Air 4K was in the loop. With Netflix, 4K/60 Hz UHD HDR content I played was delivered by Netflix to the media player as 1080p with Rec. 709 color space and no HDR. With Amazon Prime, 4K/60 UHD HDR was downconverted to 4K/24, but with Rec. 709 color (no BT. 2020 wide color gamut) and no HDR. UHD HDR content from Vudu was delivered similarly—4K/24, no wide gamut, no HDR. I confirmed each of these scenarios by checking the results against a straight-run HDMI cable in place of the wireless connection. Of course, HDR usually gets delivered by these services hand-in-hand with BT.2020 color, which together provide a much wider color gamut with brighter highlights and improved shades of gray near absolute black. Having to play content without these benefits may not be a big concern for some, but for me it's a deal breaker—what's the point of having a UHD display with HDR capability if you can't use it with the most popular streaming services? If you're in a situation where a wired connection from your source to display is next to impossible, then your options are limited. The DVDO Air 4K, despite its caveats, is the only standalone wireless 4K solution that I know of, and it may allow an installation where one may not otherwise be possible. Its performance with 4K content, even with 4K/24 HDR originating from a Blu-ray player, was nearly flawless, and there may be situations where its signal capabilities are more than enough. But I suspect its inherent bandwidth constraints—and the resulting limitations with internet-streamed HDR content—will push many viewers to expend the extra effort to run that long cable, after all. Hopefully the WirelessHD technology will improve from here and allow us to someday beam 4K/60Hz (or higher resolution) signals and enjoy the full benefits of HDR and wide color gamut from all sources, including the media powerhouses Netflix and Amazon. I have a 60 gHz HDMI setup, and it blows. The transmitter and receiver are in a direct line of sight and only 15 feet or so from each other. Nonetheless, the screen will simply go blank at random... sometimes multiple times in an hour, and sometimes only once during a whole movie. To restore the picture, I have to toggle the input on my receiver to somehow jostle the HDMI out of its funk. I avoided so-called "Wi-Di" devices because they compress, but 60 gHz is fussy and unreliable. 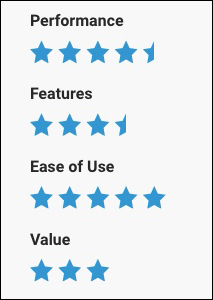 Read reviews on these products; they're quite consistent about this. I am about four more blank-outs away from smashing this junk and running an HDMI cable across my floor. Thanks What Haveyou. Interesting, as David's experience was different but he only lived with this system for a couple of weeks. The two drop-outs he did have seemed to be associated with particularly loud movie passages with heavy bass -- relevant because David has 4 serious subwoofers in this room, truly foundation-shaking stuff. So we wondered if there wasn't something either associated with the signal demands, or perhaps a mechanical break in the connection at either end due to the vibration of the room. But these drop outs never repeated on the same clips nor were there any other dropouts. These 60 gHz systems are supposed to be pretty much interference-free due to the sparse presence of other devices in that band, but if there are consistent reports of dropout issues among a range of users, I wonder if there aren't particular conditions under which the devices are indeed interfered with by either household or other local RF...or if there are any manufacturer-specific differences among the Silicon Image-based WirelessHD devices that make some more immune than others. Things like physical design of components and placement of antennas can make a difference, and I don't know how much of that SI specifies for manufacturers who license this technology. We also don't know if the newer 4K chip isn't somehow evolved to address issues discovered with the earlier 1080p solution. Another possibility that might come into play is HDMI handshaking issues that might be specific to certain devices, though if the transmitter and display successfully negotiate with one another once it seems like they should be able to maintain that connection consistently. I'll be curious to see if anyone else has any experience to share with the 60 gHz WirelessHD stuff, particularly this 4K version.